When the right and left political wings agree, you can bet middle-class Americans are in trouble. And if you are talking about Social Security, a new bipartisan plan spells major cuts in benefits, as the establishment is set to privatize our public retirement system after the mid-term elections next year. About $2.8 trillion (2,800,000,000) has been borrowed since the 1980s from your Social Security contributions to pay for bureaucratic wars on poverty. to fight real wars on ungrateful Arabs, to sweetheart deals to campaign contributors, and to create a war machine larger than all other countries combined. But the political class has decided it should not pay back this money, but will instead cut your Social Security benefits enough so they you only get benefits from FICA taxes paid in the current year, and receive none of the money borrowed from the Trust Fund, which will be dissolved. This $2.8 trillion is part of the National Debt. Eliminating it means the politicians can boast that they are cutting that debt, even if it means not paying the bill to seniors. Meanwhile, repayments on debt will continue to go to all foreign countries, the bond clippers and treasury note holders. One advocate of investing your Social Security taxes into the stock market is the Center for American Progress (CAP), founded by John Podesta, a member of the Trilateral Commission as well as Bill Clinton’s chief of staff back when, and Hillary Clinton’s campaign manager last year. That’s the same Podesta who thought G mail was the way to protect national security messages. CAP will make Wall Street cash rich with your 6.2% FICA payments, and the big banks will impose fees that will bring an even more golden age to the billionaires. In addition CAP advocates cuts to benefits for middle class recipients and increased benefits for those who contributed the least (or even nothing). The Cato (rhymes with “play-dough”) Institute is a far-right creation that wants Social Security taxes put in private funds so the stock market can guarantee your retirement. Well, not exactly guarantee, but if your Wall Street investments flounder you will get an amount equaling the poverty level, no matter how much you contributed. The institute also loves the concept of raising the minimum retirement age from 62 to 65, so the “little people” keep working and don’t get in trouble. A side benefit is that more workers in the labor pool means lower wages for all, and more profits for business and a bigger GDP. 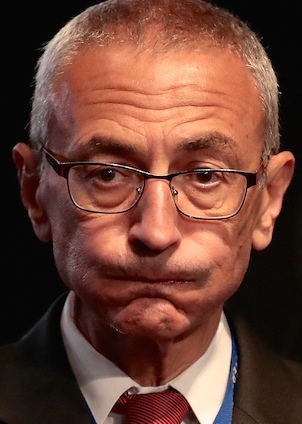 While Podesta has always been an operative of the Democrat Party and linked to CAP, the Cato Institute has mostly escaped charges of political connection. Cato was founded in December 1974 in Wichita, Kansas as the Charles Koch Foundation and later changed its name to sound less like a bunch of lackeys, who report to a very rich guy. 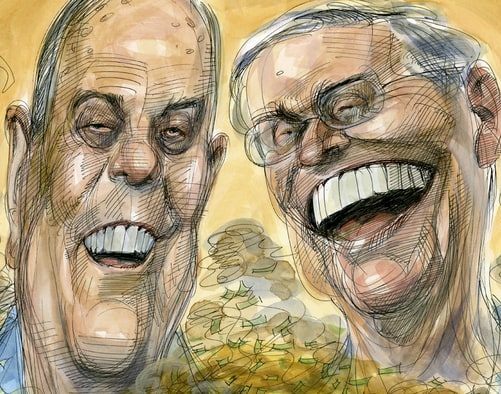 Charles Koch and his brother, David, have a net worth of $82 billion ($82,000,000,000) and spent about $800 million last year on political campaigns and lobbying – more than anyone else. By contrast to the $800 million from the Kochs, the AFL-CIO managed a little more than $16 million in contributions and lobbying during the same period. CAP and Cato also agree on virtually unlimited immigration, a stance which pleases their funders, and they want even more Earned Income Tax credits (EIC), which subsidize corporations through IRS payments to their most underpaid workers. Expect people to shoot politicians when that happens.